Luke Stark and Kate Crawford penned these now classic words in their 2014 deconstruction of emojis in The New Inquiry. They seemed especially relevant this past week as I sat in New York watching events unfold across the country’s 🛫s and in our major cities, events that left me at times 😱,😪, and 😐. I was stunned for a moment, but of course, it makes so much sense. For months, I had been studying emojis-as-language, using their prevalence across social media as a means of understanding cultural trends and pop phenomenon. Last December, my analysis of the 🍑 peach emoji confirmed it was mostly used sexually or anatomically, and almost never to refer to the fruit. (Sorry, Georgia.) Before that, I had written about the emojis of #fanlove, and refereed a long-standing dispute between Taylor Swift and Kanye West. But now, I realized that emojis have seeped far deeper into our collective consciousness than their Japanese designers could have foreseen in the 1990s. In a time of national crisis and despondency, could emojis be a way of expressing solidarity? I turned to the Twitter Search API to request tweets from last weekend - immediately after the #MuslimBan was announced. 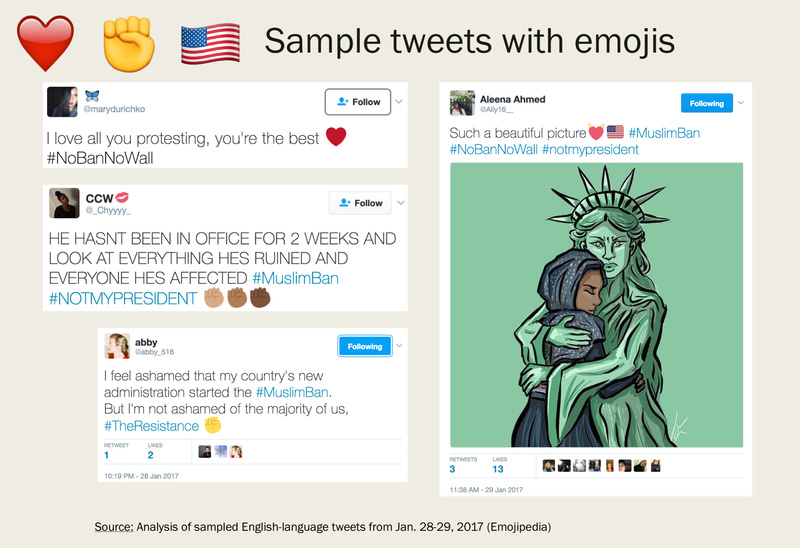 I pulled English-language tweets for selected viral protest-related hashtags: #NoBanNoWall, #NoMuslimBan, #NotMyPresident, #TheResistance, and out of curiosity, #WomensMarch. After removing retweets and deduplicating by user name, I ended up with nearly 60,000 unique tweets. 😂 isn’t in the top five for #NoBanNoWall, #NYFW, or #FirstSevenJobs. ✊ indeed appears to be a signature emoji of progressive protest, showing up in the top five for all of the protest-related hashtags as well as #BlackLivesMatter. Flags also appear in the top five emojis for #Elections2016 and #Brexit, in addition to all of the protest-related hashtags. 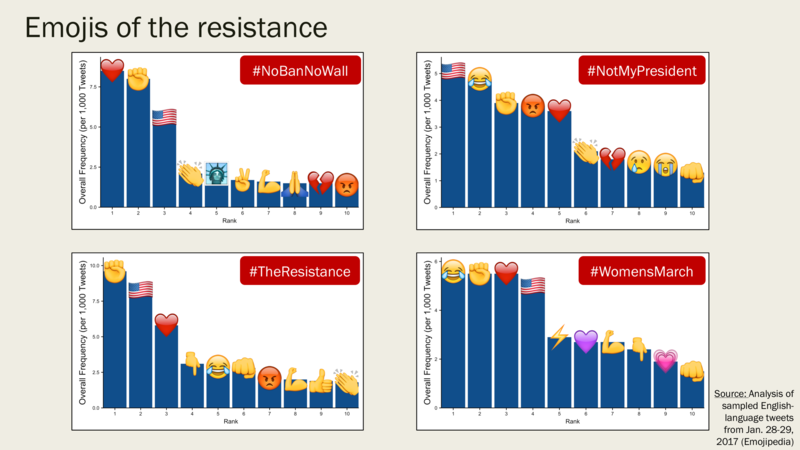 Another way of visualizing the data is to plot the top 10 emojis, by frequency, across the top protest-related hashtags. Here, we see that #NoBanNoWall reflects love and solidarity, #NotMyPresident conveys disappointed patriotism and mockery, #TheResistance communicates defiance protest-as-nationalism, and #WomensMarch is a jumbled mix of mockery, defiance, love, and country, all at once. The 👏 clapping hands emoji is also interesting in that its usage appears divided between celebrating the protesters, the attorneys, and the judges who ruled against the executive order, and also being sarcastically used to throw shade on the administration and its supporters. 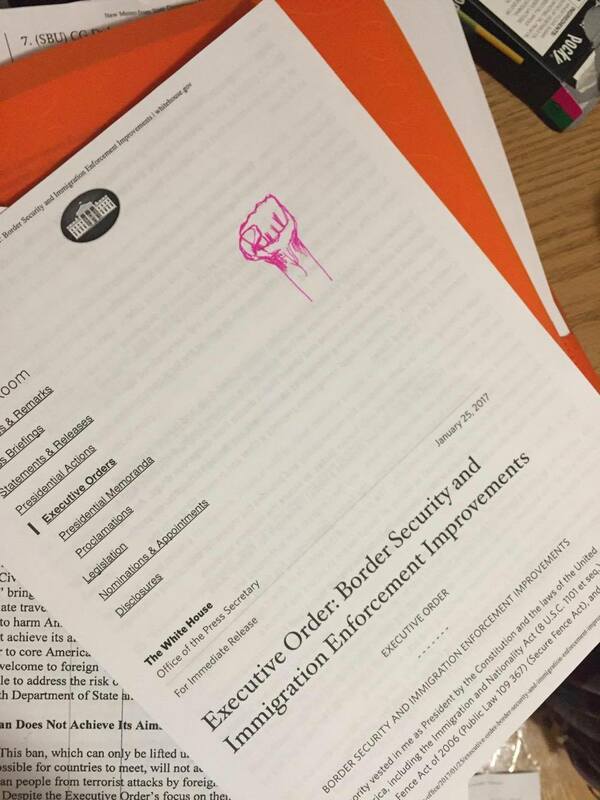 Can we quantify how people use emojis to express different forms of protest? Above, we compare word counts in tweets with 🇺🇸 and tweets with ✊. We express the results in terms of log odds ratio which is a measure of how much more often a word is used with a given emoji. On the other hand (pun intended), words that cluster with ✊ - “protesting”, “solidarity”, and “together” - seem to emphasize community based humanitarian appeals. We should admit the main limitation of our analysis is that we only considered protest-related tweets. 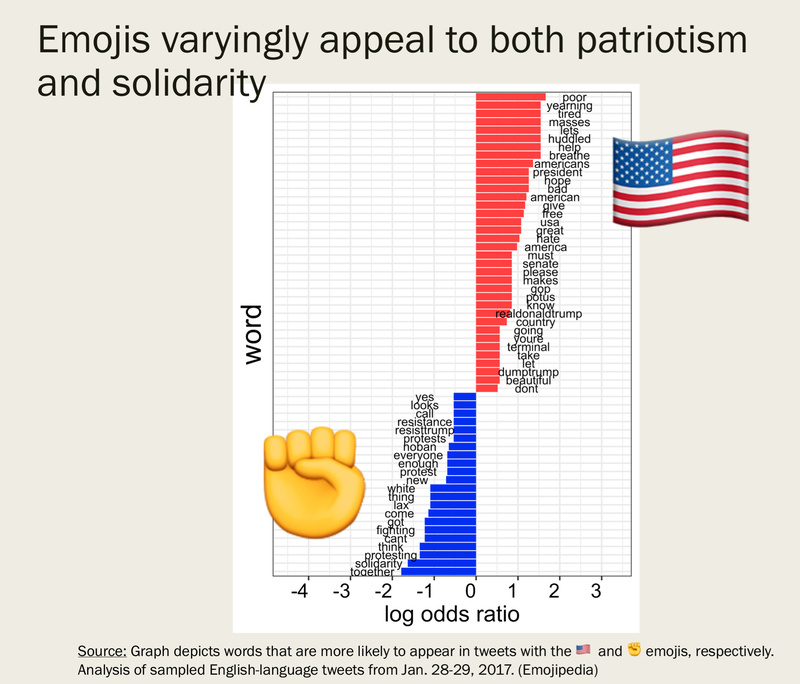 Almost certainly, emojis such as 🇺🇸 and ✊ have very different connotations for supporters of the administration and future research should examine this. We were also curious to see whether there was any meta discussion about emojis in tweets with emojis, and to our surprise, we found two tweets in our dataset that are too good not to share. We’re not sure if such an emoji is on the cards, but if it is, rest assured that Emojipedia will be the first to bring you the news.